The number of female fans attending baseball games is near even with males. It’s no surprise as the local game is a bit more accessible (and fun). -Inexpensive tickets that are easy to get (and the Seoul Olympic Baseball Stadium is huge). Ballpark food and souvenirs are cheap too. -Can bring food or drink into the stadium (back home only water, at least in Fenway Park). I often grab boneless chicken, sushi, beer,..
-Songs, cheerleaders, and a male cheering leader (the adjacent area is non-stop fan cheering and singing–get seats here). The stadium is divided in seating for fans of each team so there’s a bit of camaraderie and less boo-ing. If you make it to Korea you really should catch a game; especially if you think you won’t like it. 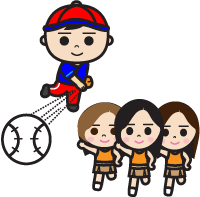 This entry was posted in About Korea and tagged -, baseball, cheering leader, cheerleader, fan, female, MLB, stadium by easykorean. Bookmark the permalink.